– A wife kisses her husband. We hear that a man left his wife for a younger woman. - A young girl and her preteen brother shut themselves in an attic where the girl screams when she sees a wedding dress on a mannequin and a ghost enters the house and gets into the attic; it slams things around loudly and traps the children between packing boxes, it approaches the boy and he brandishes an amulet causing the ghost to transform into a woman, who touches his face as black tears come from one of her eyes; the ghost looks into a mirror that cracks, and it transforms into its ghostly appearance again, screaming, jumps on the children as their mother enters the attic and is choked and thrown across the room and then a man is choked and thrown across the room; the woman stabs the shrieking ghost in the heart with a crucifix, its flesh disintegrates and we see a skull crumble and black tar whirl off the ghost until the figure disappears entirely, leaving some tar on the floor. ► A ghost tries to wash a young girl's hair, but the girl yells and the ghost's blackened fingers touch the girl's head as she goes under water, the girl comes back up, gasping and looking scared and when she looks around something unseen grabs her, pushes her under the water and blackened fingers hold her there and shake her head as she strugglers; the mother comes screaming to the bathroom as the door slams and locks itself, she gets in and grabs her daughter out of the tub as blackened fingers appear at the edges of the tub; the ghost grabs the woman's arm as they both scream for several seconds, a little smoke rises, and the ghost disappears. A man spreads seeds across a front door threshold as a supernatural barrier for the ghost that tries to open the door several times, but cannot keep it open or pass over the seeds; the door slams shut loudly, the back door slams open, but other people slam it shut and lock it as the man shouts for the ghost to leave, the door opens, the ghost flies through the house grabbing a girl as it passes through and the scene cuts to the girl floating unconscious under water in the backyard pool as her screaming mother jumps in and the woman and the ghost scream at each other under water as the mother is choked until a man pours salt into the water, prays, the ghost disappears (both the woman and the girl are fine) and the man says the pool is now filled with holy water. ► A boy and a girl are locked into a closet temporarily for safety and the girl leaves and opens the house's front door, breaking a protective barrier of seeds laid across the threshold; a woman wearing a long gown enters and points a handgun at a woman, then shoots a man in the shoulder and he falls down as the two women struggle until the first woman locks the second woman in a basement, the second woman shouts, screams, and pounds on the door and the other woman finally releases her. A woman and a man visit a dark house looking for two boys; we see two young boys forced to live huddled inside a locked closet that has a large magic eye carved on the door, their mother yells at the other woman, knocks her down, and chokes her, until the man drags the attacker off-screen. 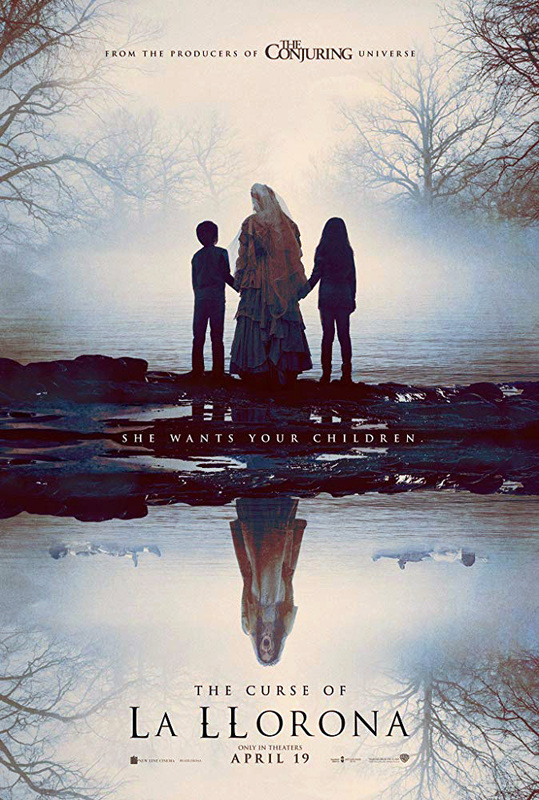 ► Two boys in an orphanage are startled awake and one seems to be in a trance as a ghostly woman appears in a mirror that cracks as she screams and grabs the two boys; the scene cuts to a reservoir where we see several cruisers parked near two small bodies lying wrapped in sheets and the mother of the boys approaches and screams at another woman and later tells her that she prayed to the ghost to kill the second woman's children. A small boy is lost in a field, he walks to a lake and sees his mother choking and drowning his younger brother, and then she chases the other boy and grabs him as the boy shouts, "No, Mama!" and the scene ends. ► A ghost flies across the screen and grabs a child or children and a woman by the forearms, leaving raw red burn-like wounds that bleed in a few scenes (we also see a little smoke rise as she touches the people). A ghostly woman wearing a dingy bridal dress and veil screams toward the audience in close-up several times throughout the film; she has a stark white face, glowing white eyes, graying hands and blackened fingers, black lips, and black tears streaming down her face with a sheer gray veil sometimes covering her face. A preteen boy leaves a car with his young sister asleep inside and he sees two small bodies wrapped in sheets and finds a crying ghost in some bushes; the ghost flies forward and grabs his arm, burning red marks into his skin as they both scream, he escapes, rushes to the car, pounds on the window and screams for his sister to let him in and he locks the doors; the windows go down by themselves and he struggles to roll them up, he sees the screaming face of the ghost twice outside the windows, and then it disappears. A ghost appears in a mirror that cracks and a woman sees it and screams. A ghost appears in a room and a woman grabs a ball bat shouting three times, "Get out of my house!" and the ghost disappears. ► We hear several squeaking windows and doors that slam open and closed, creaking floorboards, thuds, crunching, heavy footsteps, crying, and loud shrieking music. Winds whip up several times and blow through curtains and scatter papers; there are many dimly lit scenes and dark rooms, lights go out and candles extinguish themselves; also, car windows roil themselves up and down. A woman and a man shaking a shaman's rattle place dozens of candles around and inside a house and the lights go out, lighted candles extinguish themselves and a ghostly woman appears on a staircase and hovers over the woman grabbing her and throwing her into a wall, breaking glass vases and shelves that scatter pieces of glass over the floor; a boy and a girl hide under a table, and the ghost jumps onto the two shouting children, mumbling and screaming as the man throws what he calls anti-venom onto the ghost to burn it and it disappears. ► Strong winds knock down a preteen boy in a room as a ghost charges through an upper story window and grabs him, it knocks him down a flight of stairs and disappears. We hear thunder as wind blows an umbrella three times after a ghost is reflected in it; a young girl reaches for the umbrella when it is blown into a swimming pool and the ghost grabs the screaming girl, but then disappears. A girl goes into a trance temporarily, but comes out of it. A boy seems to be in a trance, but comes out of it and his mother tells him he was sleep walking. ► Two boys tell a woman, "She will hurt us," but they say the "she" is not their mother, they have small red burns like fingerprints on their arms and we later see several photos of the burn marks; the boys are then removed from the home and put into an orphanage. A woman takes her son to a doctor who puts a bandage on his wrist that is sprained, asks about burn marks and the boy says he fell. A social worker questions two children about child abuse; they answer that the boy fell. A police officer tells a woman to fix whatever is wrong with her home and family. ► A man says that in the 17th century an en6raged woman drowned her two young sons after her husband left her for a younger woman, and then also drowned herself; since then, her spirit wanders wearing a ghostly wedding dress and veil, crying and killing children. A woman and her two children visit a priest and he explains the burn marks on their arms are from the attacks of a ghost. A man tells a woman that his encounter with a demon-possessed doll taught him about demons and he refers her to a former priest who is now a faith healer, and the second man tells them to stay in their house and fight the ghost. A mother tells another woman that a ghost is trying to kill her two young sons, who show burns on their forearms. Police say that they think a woman killed her own sons. A woman tells an interviewer at police HQ, "You killed my boys, not me." We hear that a woman is a widow. A woman's reflection in a puddle on the ground seems to turn into the face of a woman from the 17th century. ► A man takes a sample of tears from a puddle on a floor and the sample looks like tar. A man does a ritual with eggs; he prays and breaks an egg into a bowl, revealing something like black tar; three other eggs spin on a table and explode, splattering black tar on a woman's face. - A woman pours wine into two glasses and she and a man drink from them, and a woman asks another woman if she is drinking and the second woman denies it and shows no signs of drinking. A shop is full of potions in bottles and amulets, a man uses an ornate metal container on a chain to spread incense smoke around a house, a close-up shows a glass pot of what looks like thick black tar boiling, and two shamans smoke-smudge people outside a church with sage bundles. - Legends, Latin superstitions, ghosts, demons, infidelity, rage, violence, revenge, child abuse, child killings, exorcisms, Catholicism, belief, faith healing, shamans, motherhood, single mothers, sadness, guilt, danger, fear, things that cannot be explained. - Child abuse is sometimes attributed to ghosts and demons, but some things cannot be explained.